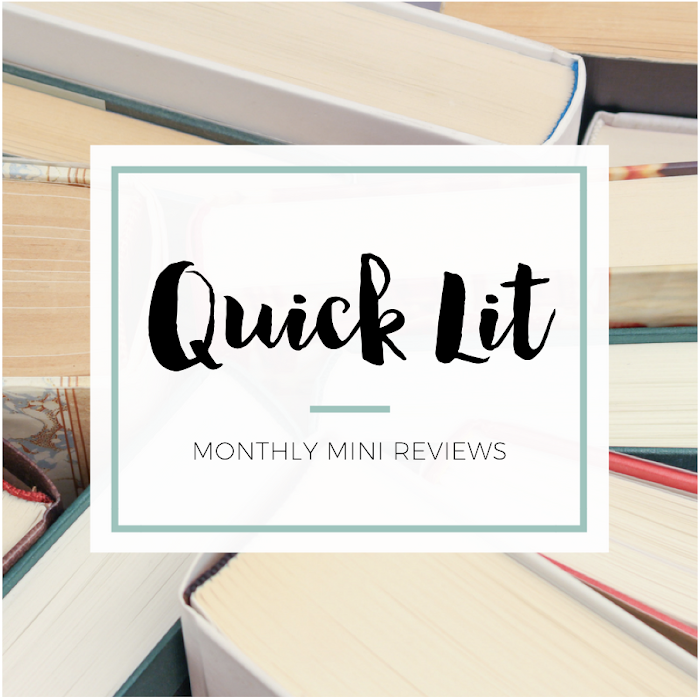 I read 16 books in December, and I'm reviewing 14 of them in December's two-part Quick Lit post. If you missed it, yesterday's Part 1 featured reviews for six individual books. Today's is focused on the two series I binged during December. 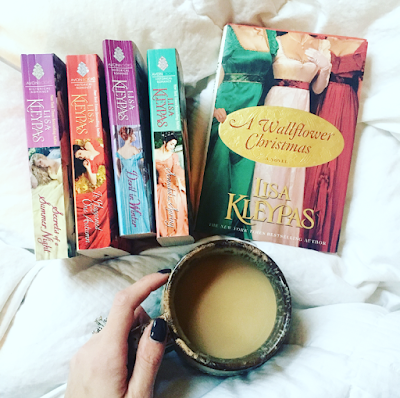 If you're looking for more book recommendations, check out the linkup at Modern Mrs. Darcy. And with this post, I'm now (almost) caught up on reviewing what I read in 2017! There are three exceptions: a review book that isn't out yet, a series I binged that deserves a little something special, and a new addition to an all-time favorite series that I loved so much I've dragged my feet on writing about it. But they'll happen soon, I'm sure! My Goodreads goal was to finish 52 books in 2017 because I had no idea what my reading life would look like with a toddler. So, you can imagine my surprise that I read 151 books! I had a great year, but here are my 20 favorite books. SECRETS OF A SUMMER NIGHT, IT HAPPENED ONE AUTUMN, DEVIL IN WINTER, SCANDAL IN SPRING AND A WALLFLOWER CHRISTMAS BY LISA KLEYPAS | I've heard nothing but praise for this series from all of my historical romance loving friends. When Kelly saw how much I was enjoying Anne Gracie's books, she begged me to give these a try. She warned me they'd probably be a little steamier than I'd like (they were, so I skimmed/skipped some) but that I'd fall in love with the female friendships (and I totally did). They were on my mental "maybe someday" list until Alexa's recent re-read + the appearance of like-new copies at my local used bookstore prompted me to pick them up. Secrets of a Summer Night introduces the Wallflowers, a group of four unmarried women who band together to help each other find a husband. I immediately loved the girls and their scheme, so everything was off to a good start. Kleypas' writing just pulls you in! Annabelle is beautiful but poor, so she needs a wealthy husband to save her family from disaster. Of all the girls, she was my least favorite -- she was such a snob! She gets better, but still... I was annoyed by all the men in this book who just wanted to make her their mistress, but the hero proved himself in the end. I So Liked It overall. How could the hero of Devil in Winter redeem himself after the events at the end of the previous book? I honestly wasn't sure it was possible. Well, I should have trusted Kleypas because she made me believe that he could be redeemed. Plus, Evangeline caught me by surprise. I totally underestimated her! Of all the books, this was had my favorite story. I loved the elopement, the casino, the threat to Evie and, most of all, the character growth for both of them. I do love when a rake meets his match! I just couldn't put this book down and So Enjoyed It. Next up was Scandal in Spring with Daisy, Lillian's younger sister. I think Daisy always faded into the background when Lillian was around, so I didn't realize what a delightful heroine she'd be! I loved that she always had her nose stuck in a book and was such a dreamer. In Pride and Prejudice, Lizzie tells Darcy, “I had not known you a month before I felt that you were the last man in the world whom I could ever be prevailed on to marry.” That's how Daisy feels about the man she's supposed to marry, and I loved every second of watching her realize she was totally wrong! I So Enjoyed It. And finally, there's a little bonus book: A Wallflower Christmas. Rafe Bowman, Lillian and Daisy's brother, is at the heart of this novella. He's come to England in search of a bride and, of course, the Wallflowers plan to get involved in his love life. It's what they do best! I wanted a little more development in the romance because it felt like it all happened so quickly, but I was still pretty swept up in it. But my absolute favorite thing about the book was catching up with all four women -- it was like a bonus epilogue that just made me so happy. I So Liked It and was sad to say goodbye to the Wallflowers! SOMEONE TO LOVE, SOMEONE TO HOLD AND SOMEONE TO WED BY MARY BALOGH | I'll be honest: I totally bought these books because I liked the covers. Yes, sometimes I'm that kind of reader. Thankfully, it paid off in this situation! 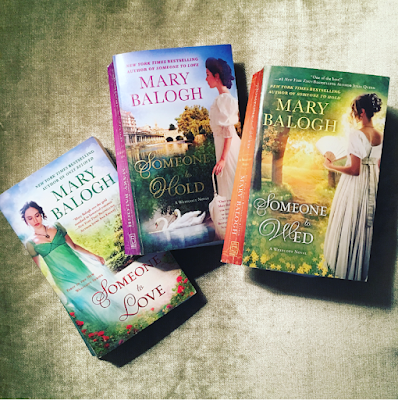 These are the first three books in Balogh's new Westcott series. The Westcott family is in turmoil when they learn that the recently deceased Humphrey Westcott, Earl of Riverdale, had been keeping a devastating secret regarding his marriage. I'm a sucker for a good series focused on a single family! Someone to Love introduces the family and reveals that secret. The book is confusing in the beginning (too many characters) and has uneven pacing, so it took me some time to get drawn into the story. I liked the heroine immediately, but I was less sure of the hero. He's unconventional -- in looks and actions -- which made him unique but also really interesting. Both characters are reserved in their own way, so it was challenging for me to get invested in them. I didn't feel like I knew them that well! I So Liked It but a lot was going to hinge on my reaction to the second book. I knew the heroine of Someone to Hold was a character I didn't really like in the first book and that the hero was originally in love with the heroine of the first book. I mean, hello, that sounds like a recipe for disaster. And yet, somehow, Balogh completely won me over! There was such great character development in this book, and I think that's what made fall in love with this story. I enjoyed the hate-to-love vibes (one of my favorite tropes) and the way the romance grew out of their blossoming friendship. It was just so good, and I So Enjoyed It! It sealed the deal on my investment in the Westcotts. And finally, we come to Someone to Wed. This is definitely my favorite in the series so far! I liked the hero from his appearances in the previous books, but I just fell in love with him in this one. He's so honorable, kind and thoughtful! There are so many rakes in this genre that it was delightful to read about someone quite different. And the heroine broke my heart with her past and low self esteem. It was so amazing to see her finally realize her value! Balogh excels at depicting the emotional lives of her characters, and it gives me ALL THE FEELS while I'm reading. I So Loved It. First off, WHOA at all of these series and romance titles! I can barely keep up. Your enthusiasm for them is keeping them on my TBR. Hopefully I can get to them soon so we can discuss. Maybe I missed it somewhere, but...what's Modern Mrs. Darcy? Is this a new blog of yours? Haha! I know -- I was bitten by the romance bug at the end of the year. I think it helped that there were exactly what I needed - fun & engaging but still pretty light and quick to finish. The perfect type of read in busy December! 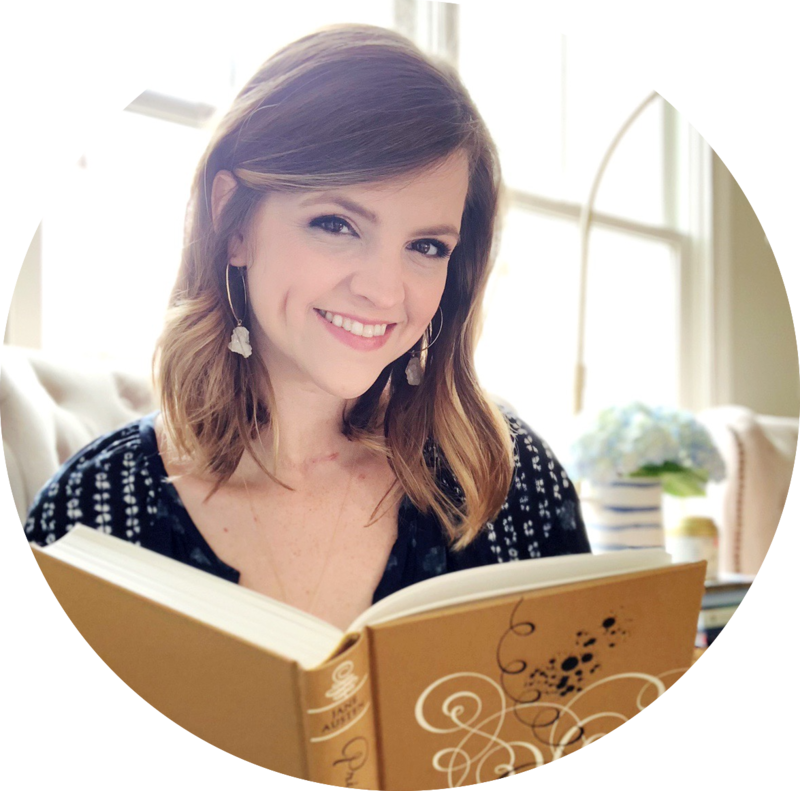 And I replied on Twitter, but just in case you didn't see it: Modern Mrs. Darcy is a blog I love that hosts a monthly linkup called "Quick Lit" for review recaps like this one. I like to include a link since I'm using that title for my posts!